Recent reports suggest that HTC is going to release the HTC One in another color which is Blue. If the reports are true then it will be the 4th color for the HTC One. At the launch time, HTC One was available in black and silver variant and later the company announced another color red. The serial photo leaker evleaks posted an image of the HTC One. 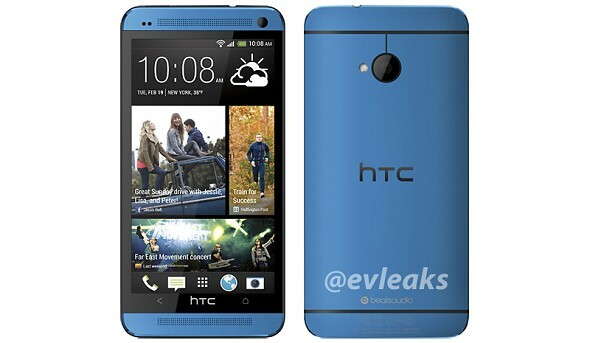 The color of the HTC One in the leaked image was blue. Other than the color, the image also showed the back and front of the new device. There has also been a rumor that the Taiwanese handset maker is prepping the variant of its flagship smartphone for a specific carrier but it is not sure which carrier but it is expected to be Sprint or T-Mobile. The HTC One will feature a 4.7-inch screen with full-HD display. The HTC One will be powered by a 1.7GHz quad-core Qualcomm Snapdragon 600 processor. Other than this, it will have a 2GB of RAM. Connectivity options including Wi-Fi, Bluetooth, GPS, NFC, Infrared and Micro-USB are also going to be available on the device. The smartphone was launched with Android 4.1 (Jelly Bean) along with a brand new version of Sense UI. It has received the Android 4.2 update, as well. Afterwards the company posted a teaser video on Tuesday suggesting that something big is arriving as well other than the HTC One. Verizon will be releasing their HTC One on August 22 according to the leaks and so it also hints at the possibility that the new Blue HTC One will be arriving via Verizon. More color options for their main flagship device clearly suggest the changing trend of the market and how the market responded to the Galaxy series variants which were released like a couple of months ago. We are still to hear something official from the HTC regarding the HTC One Blue but we are pretty sure that it is authentic and will be arriving in the local market in August or September. What do you think about this move from the HTC? Do you think it will boost the sales of the HTC One? Leave us comments down below and share your views with us.